A few years ago I made my first savoury cake as a guest chef at a cafe on the outskirts of Mumbai. We piled it up with spaghetti and served it cut into wedges with sauce drizzled all over. 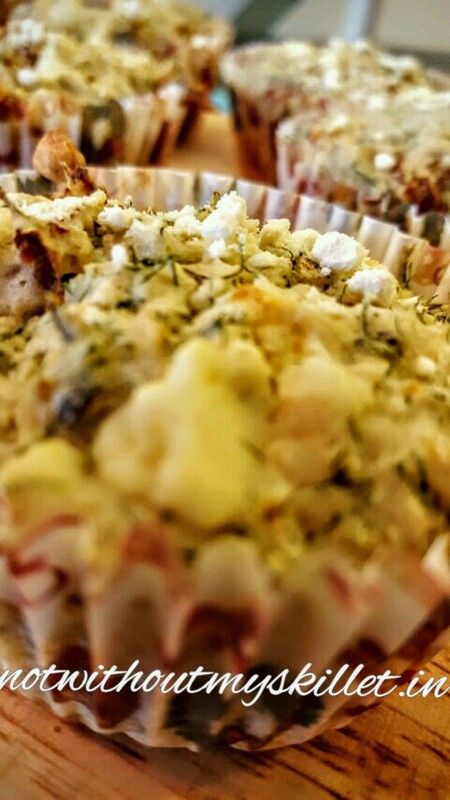 Post that the savoury cake obsession died down till I discovered Savoury Muffins. 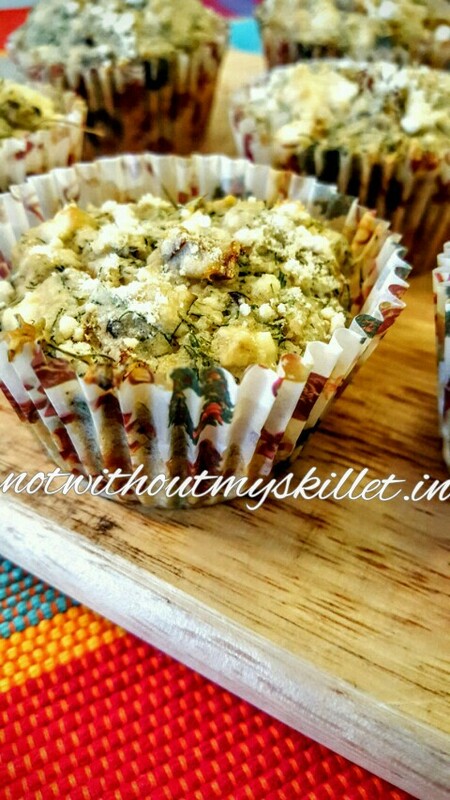 They are the perfect tea-time treat, combine it with the spice and veggie of your choice and you have a herby delicious healthy bite. 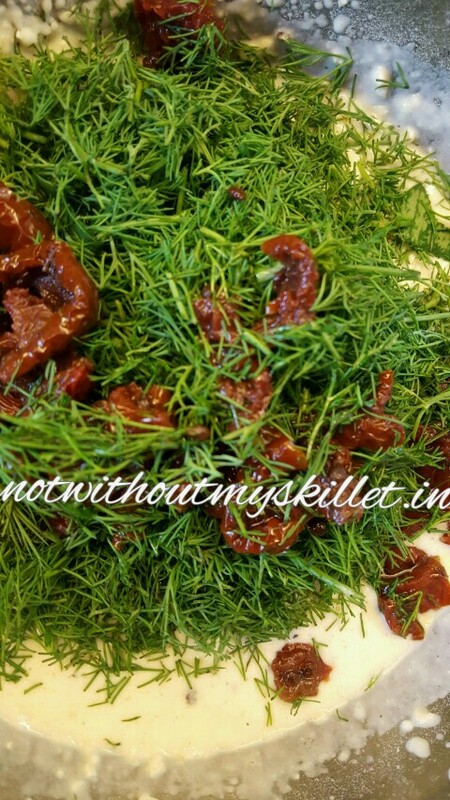 I’ve used smoked tomatoes, but a lot of friends didn’t manage to find this particular ingredient, you can substitute it with sun-dried tomatoes that are easily available. If you are not concerned about the extra oil it may add to the dish, you can go with the bottled versions where the tomatoes swim in olive oil. Or else opt for the dry version. 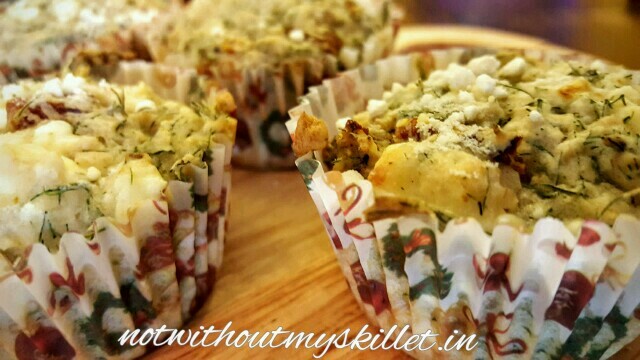 What’s more you can try varied combinations to cook a muffin on your choice. 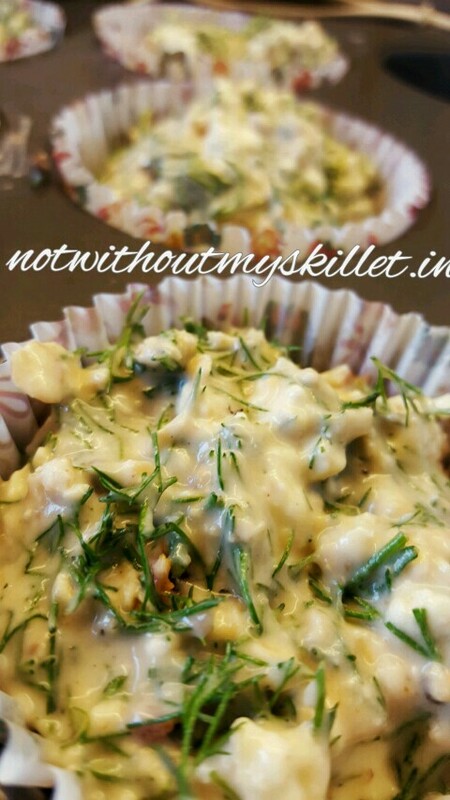 You can substitute milk with yoghurt, dill with herbs like parsley or oregano and add meats and mince. I plan to make a ham, cheese and rosemary next! 1. Pre heat your oven to 200 degrees. 2. Beat the butter and eggs together. Then add milk and combine well till top is covered with bubbles. 3. Mix in the flour, oats and baking powder. Use a fork to mix it into the wet mix. 4. In another bowl combine the dill, smoked tomato and add it to the egg and flour mix. Do not over mix. Add the feta. Mix lightly. These muffins do rise a bit, though not as much as the sweet kinds. Fill in the liner up to the 3/4th mark. 5. Grease a muffin tray and line it. Add 2 tablespoons of the mix in each muffin liner. Sprinkle the Parmesan cheese on top. 7. Serve warm or at room temperature.